Walt Disney believed that he could imagine, create and build the happiest place on earth, but we all know it takes a village to make grandiose dreams a reality. 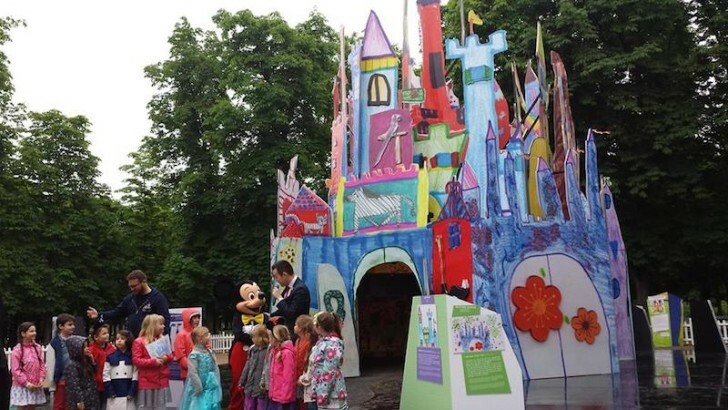 So when Disneyland Paris commissioned thousands of children all over Europe to draw their rendition of a castle of imagination, the onslaught of ideas that were submitted were only the beginning of what would become an incredible tribute to the importance of fostering childhood creativity. After receiving over 1,000 entries, 16 renderings were selected for the design and construction of what is now a real life 10 meters high “Imagination Castle” in the heart of Paris that features an amalgamation of the creative artwork from little dreamers. Click through to watch this castle of creativity come to life. Walt Disney�believed that he could imagine, create and build the happiest place on earth, but we all know it takes a village to make grandiose dreams a reality. So when Disneyland Paris commissioned thousands of children all over Europe to draw their rendition of a castle of imagination, the onslaught of ideas that were submitted were only the beginning of what would become an incredible tribute to the importance of fostering childhood creativity. After receiving over 1,000 entries, 16 renderings were selected for the design and construction of what is now a real life 10 meters high �Imagination Castle� in the heart of Paris that features an amalgamation of the creative artwork from little dreamers. Click through to watch this castle of creativity come to life.